Start Here! - Guilt Free Clothing:Wear the "right" thing! Our top recommendations for Men! Ok, it is a little embarrassing, but here are the best sources for underwear, socks and undershirts that I have found, purchased and wear daily! Click me to find out more about Wigwam! Click me to BUY Wigwam Socks - This site has Great Prices! Another Great place to buy Wigwam and more! My favorite; SOS From Texas. Funny name, great company history, and great ORGANIC t-shirts! Visit Gary Oldham's site and check them out! Union House also carries nice USA made undershirts - These are a bit softer in texture. I love these, too! Max, in Wyoming, Minnesota runs "Union House Apparel;" The ONLY bricks and mortar all Made in the USA store in AMERICA (that I know of). These are stitched by "Union Line": label in Chicago. There are more choices out there - just do a Google search for "Made in USA T-Shirts" and you will find them. The two above are simply my favorites. Again, it is UNION HOUSE providing this excellent product - knitted by a Unite Here! shop. Click Here to by Union House Made in USA Briefs! For Boxer shorts you can try these guys: City Boxers - They seem to take their boxers very seriously and they are Made in USA by a two person run company in Bangor, ME! WOW! When I contacted them they assured me that neither of them were sweating;-). They are pretty expensive, though. Check them out! Click Here to Buy CITY BOXERS! Shirts, Pants, Jeans and Shorts - All Child Labor & Sweatshop Free!! This is getting fun! This is the ONLY consistent manufacturer of button up, lightweight cotton collard "camp" style shirts featuring multiple styles in America! I have scoured the internet looking for these and have only found D'Accord and one other source. I challenge you to find them! The shirts are sewn in Florida, are excellent quality, and have a long and historic pedigree. I have spoken directly to the owner and he assures me that they are sewn in non-sweatshop and child-labor free conditions. He is a really nice guy, too! Find out about and buy D'Accord Shirts Here! "Hawaiian Shirts" Yep, of course they are American made! Obviously, shirts made in Hawaii have to follow US rules for hours, wages, and safety conditions! That should make them Sweatshop-Free and Child Labor Free. What took me so long to figure that out? Here are my favorites so far. I have called these companies and spoken to them. They are nice folks and assured me that they are no sweatshop! Click here to check out and buy BananaJack Hawaiian Shirts here! Many choices here - most manufactured by King Louis, USA. Great Quality! Check out and buy from All American Clothing - great polo shirts! Here are some great choices at All USA Clothing! Our Favorite: Brand of the Free T-Shirts! Click here to check out and buy. Cool designs! For simple casual t-shirts in many colors, check out All American Clothing. Well made and durable. Click here for soft, eco-friendly shirts made with Bamboo! Click here for a cool "open-source" t-shirt site with user submitted designs! Be sure to select the "American Apparel" t-shirt to get a guaranteed sweat-shop free tee. Their own brand "Threadless Custom" is made in Bangaledesh which they assure is not a sweatshop. Read this information and you be the judge! There are still a few choices for dress shirts out there. Here are some that I could find, please let me know if you find more! Click here to check out and buy OXFORD style Dress shirts from Union House! There are really only 5 choices for American made Jeans - and you have probably NEVER heard of any of these great manufacturers. Click the Jeans & Pants link on the Home Page to see them all. Pointer Brand Jeans have been made in Bristol, Tennessee since 1913. These are some of the nicest people making these jeans - just call them to find out! The denim is soft, yet thicker and more durable than anything you might buy from a local Big Box or National Chain. The price? Incredibly reasonable! The fit? Awesome. Made right here in America! Make these jeans your first purchase; I did! Find out about Pointer Brand Here! Texas Jeans used to make Wrangler Jeans, until they outsourced to China. Now the company makes military uniforms and their own rugged brand of jeans: Texas Jeans! I have two pair of these and they are fantastic. A little tougher than Pointer Jeans and cut a bit different. Click on the link below to check them out and/or purchase! 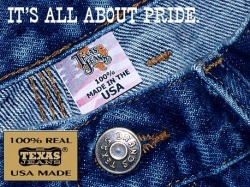 Find out about Texas Jeans here! Made in USA shorts are RIDICULOUSLY hard to find! You have so FEW choices that it is amazing that there are any at all. Basically, denim shorts are relatively plentiful. Denim and Twill fabric shorts can be found through Pointer. All American clothing has some awesome shorts. Well, this is simple: There is only ONE remaining sneaker manufacturer in America - ONE. That company is New Balance. And not ALL New Balance sneakers are Made in USA, you have to check the label. Basically, the more expensive models are the Sweatshop-Free ones. Try as you might, (and if you find one - tell me at chris@guiltfreeclothing.com) you will find no other tennis shoes made in America. There are more choices for Made in USA, sweatshop-free dress shoes than most categories of apparel. Again, Google "Made in USA Shoes" to find them. These are my favorite two: Allen-Edmonds and Neil M. by Munro. I have spoken to the 'top brass" at each company, and have been assured of the working conditions and wages for the workers. Both companies claim to be sweatshop-free! Allen-Edmonds does have a small plant in the Dominican Republic for it's hand sewn lower priced line, so be aware and check the source of the model you choose.. All of their other shoes are made my traditional cobblers in Port Washington, WI! Munro shoes are (almost) all made here in the USA, according to an email I received from Neil Munro himself! Again, read the description carefully when choosing. Good luck choosing, you have lots of great choices! Click here to check out and buy from Allen-Edmonds directly! Click here to buy Allen-Edmonds at Zappos! You don't have many choices here - only ONE! Okabashi Sandals are made right here in Georgia, from recycled and/or recyclable material! They feel a little different on your feet, as they are made from a rubber-type material. I like them, but they don't feel like my old Rainbow Sandals that had to be abandoned due to the nature of this project! Okabashi literally represents the only Made in USA sandal I can find! Again, if you find a Sweatshop-Free Sandal made in America, Canada or Europe (or ANYWHERE for that matter) please let me know at chris@gulltfreeclothing.com. Swimsuits are HARD TO FIND! Our favorite are Katin Custom Board Shorts - Hand made in Surfside, Ca by the same people who made them for THE BEACH BOYS! Katin mostly carries shorts made overseas, so you have to go there or specifically order custom shorts. They are way cooler, anyway! You can still have a pair custom sewn by Sato Hughes herself, who inherited the business from Nancy Katin and now runs the surfshop with her son. She has been sewing for Katin since 1961! I found two other sources of swimshorts listed below, but I got the Kanvas by Katins! Click to Check out and order Katin Boardshorts here! Click here for Board Shorts by Mangrove Monkey, made in Florida!